Consider for a moment, the carrot. It is literally, one of the most down-to-earth veggies that we have. You’d think that something so humble would do well no matter what type of above-ground procedures it endures. You know those baby carrots that they sell in the plastic sack? Yeah, they aren’t actually baby anything. They are regular carrots which are whittled down, and treated with chemicals. Don’t go there. Buy fresh and cut them yourself. They’ll be about half the price as well. I’m a big fan of IQF (individually quick frozen) produce. As soon as they’re harvested, the vegetables are taken to a processing center very near the fields. They are normally frozen within minutes. So, unless you grow them in your own yard, it’s hard to get much fresher. With peas and corn, the sugars start turning to starch as soon as they ae picked. I almost never buy fresh peas, and only purchase corn in the summertime, from a farmer’s market. Fresh is almost always best. Not though, for our friend the carrot. The hard flesh seems to turn spongy when frozen, and the texture of the cooked carrot becomes unpleasant. I think the sugar and ice crystals really slice the carrots up and they become badly damaged. It makes for a very unhappy eating experience. We eat a lot of carrots, but it’s always from fresh. My favorite cooking method is glazed. It seems that no matter how many I make, there are never leftovers. It’s a simple dish, so every component is important. Each ingredient has a cheaper, faux version, but I urge you not to use them. You’ll only use a bit of each item, so it’s not an expensive dish. Chinese five-spice powder is an ingredient in my carrots. I also use it in my holiday ham, and on sweet potatoes, among other things. It’s a spice blend used in many Asian dishes. If you eat much Chinese, you’ll recognize the aroma. Traditionally, it’s a mixture of star anise, clove, Chinese cinnamon, Sichuan peppercorns, and fennel seed. Simple, right? Yeah, not so much. I use is a brand called Dynasty. I get it at Li Ming Asian Market (3400 Westgate Dr, Durham). But, I’d picked up a jar of Spice Islands at Kroger once when I thought I was out. 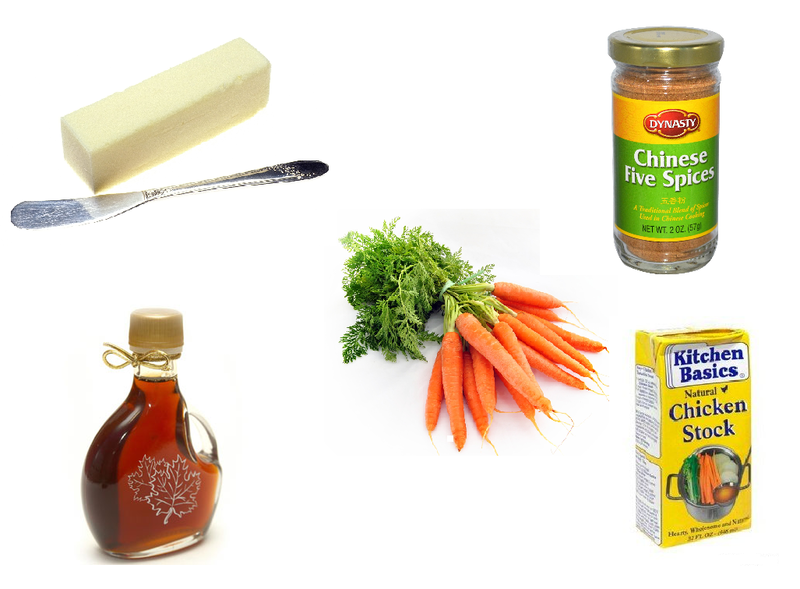 I’d never even opened it, so one day when my mom was visiting, I told her about the carrots, and gave her the recipe. To save her a hunt, I decided to give her my unopened bottle. Then I looked at the ingredients. First off, there was way more than five; secondly, the only thing I recognized was cinnamon. And, the aroma was not right. I tossed it, and gave her a bag with some from my Dynasty bottle. Put everything into a heavy skillet. Cover and cook on medium until the carrots are crisp-tender. Uncover and continue to cook until a thick, glazy sauce has formed. Hey, don’t get me wrong, I love making do, and saving cash. But sometimes it’s not worth it. What you save in money, you’ll lose in flavor and enjoyment. So to save up for those cute boots, buy your meat on sale. But don’t cheap out on the glazed carrots.